50 shades of white; TV debate between Prayut, Yingluck and Abhisit? White has become the colour of beauty for women and men. But should it be that way? Why do many Filipinos want to have fair skin? This is one of the important questions that we should raise in our time. The numerous skin-whitening products in supermarkets and pharmacies-and all those billboards that glorify the "flawless beauty" of fair-skinned celebrities-speak of the magnitude of this desire. Memorably, several years ago one billboard featured "before and after" pictures of actress Jinky Oda, touting her transformation through oral glutathione "from ebony to ivory." White has become the color of beauty, not just of women but also of men like Xian Lim and John Lloyd Cruz. The desire for white skin is far from universal. Whitening products are nonexistent in many cosmetics shops in the West. Instead, there are tanning lotions that promise to yield the desired "bronze" color that evokes vacations in paradise. On the other hand, in many Asian countries, white skin has been prized since ancient times. In India, for instance, as scholar John Franklin points out, the words for fair-skinned and beautiful are synonymous, while in China, there is a saying that "one 'whiteness' covers up three 'uglinesses.'" Arguably, however, the desire for lighter skin has intensified in our time. It is forecast that the global skin-lightening industry will reach $20 billion in 2018. On top of lotions and tablets, many Filipinos are actually having themselves "treated" with intravenous glutathione, spending an hour attached to an IV line-and forking out up to a few thousand pesos-per session. To understand why many Filipinos pursue skin-whitening, we must look at the things that people associate with white skin. For instance, since ancient times, white skin has been linked to wealth and power. In many agricultural societies, most of the people had to work in the fields-exposed to the sun-and thus they tended to be darker than the elites who could afford to spend more time in their houses. Thus, fairness came to be a sign of one's high socioeconomic status. Today this is reflected by the advertisements themselves. For instance, one soap advertisement claims that to be white is to have "kutis mayaman"-i.e., the "skin of the rich." White skin is also associated with racial identities. White Americans, Europeans and East Asians are considered to have fair skin-and perhaps not coincidentally-highly regarded, both culturally and aesthetically. "Maging kutis Koreano!" (Have the skin of Koreans!) reads one Instagram post for a glutathione product. However, it must be pointed out that people don't necessarily try to lighten their skin to have the same skin colour as foreigners. Colonial mentality alone doesn't explain the phenomenon of skin-whitening. Of course, whiteness is associated with beauty. To be fair, morenas continue to have their place in our pantheon of beauty-Angel Locsin, Lovi Poe and Bianca Gonzalez, to name a few-but even they are lighter than the average Filipino. Indeed, the predominance of (relatively) fair-skinned celebrities today makes one wonder if skin complexion is part of the criteria to be a star. The preference for whiteness can also be seen in everyday choices people make. In this age of Photoshop, how much lighter than their actual complexions do people appear in their Facebook profile pictures? When I went to a photo studio recently, the 2×2 pictures that came out showed me a few shades whiter. My list is far from exhaustive, but it is important to add that these concepts-wealth, race, beauty-often overlap. Being mestizo can lead to stardom, which can lead to wealth. And to begin with, by virtue of our political and economic history, many of our wealthy families happen to be mestizo and chinito. Individuals themselves offer various motivations for skin-whitening. Some would say that a whiter skin gives them more confidence. Whitening, just like many beauty practices, is not just about looking good, but also feeling good. Moreover, perhaps the quest for whiteness among Filipinos-just like pursuit of a tan by Westerners-is simply an attempt to stand out, to distinguish one's self from the others. But beyond individual preferences, we also need to consider the broader implications of this desire for whitening in our society. For one, it is very important to ensure the safety of the products themselves. Hydroquinone, for instance, has been banned in other countries for potential health risks, but continues to be found in whitening creams in the Philippines. In 2011, the Food and Drug Administration issued a strong warning against those who use intravenous glutathione for skin-whitening, naming skin damage, kidney and thyroid dysfunction, and even death as possible side effects. Moreover, we need to have a meaningful conversation about skin color and how, in the process of glorifying white skin-and of equating whiteness with beauty-the converse also happens: that of putting down those with dark skin, or even those who happen to be kayumanggi. Have we participated in this regime by accepting such a standard as our own? Since time immemorial, humans have shown willingness to suffer in the name of beauty-"tiis ganda," as they say. Modern examples include the wearing of extremely high heels and starving one's self in order to have a slim waist. Add to that the burning sensation after the application of an exfoliating skin-whitener, and the pain of inserting the needle through which the IV glutathione must flow. All for the pursuit of 50 shades of white. The writer is a physician and medical anthropologist. 2. A TV debate between Prayut, Yingluck and Abhisit? It's not likely to happen, but wouldn't it be interesting if someone could get Premier Prayut Chan-o-cha and his two predecessors - Yingluck Shinawatra and Abhisit Vejjajiva - to appear together on the same TV programme to discuss Thailand's future? They wouldn't even need a TV anchor. Instead, each could take turns posing questions to the other two. In fact, General Prayut has indicated that he might be interested in a job as a reporter once he steps down from the "tiger's back". But then, he could also have been serious when he taunted reporters last week in one of his daily sparring sessions with the Government House beat. "You reporters don't really get it. The people invited onto the programmes include former government figures, National Reform Council members and non-government personalities. You may or may not watch [this programme, but] these people will be in the government in the future. You should listen to them so that you can determine whether they are saying the right things or not ... whether what they say can be implemented or not … whether they were involved in causing damage or not. But if you post big headlines without watching, then I can do a better job as a reporter than you people. I might quit as prime minister to become a reporter. I will beat you all. I can write much more interesting stuff. Mind you, I am not insulting you guys…"
The premier's threat to switch careers is, perhaps, even more frightening for the country's media professionals than the pressure on editors and columnists, or veiled censorship. Much more serious, though, is the possibility that the reporters might have missed a really big scoop. Who knows, Prayut may have been quietly making another major surprise political move (the first one took place on May 22 last year) by getting the little-known Centre for Reconciliation and Reform to put opposing politicians and commentators together on TV to exchange views. And the ever-watchful media people haven't even taken note of that significant event. Keen observers have every reason to speculate that the premier might be up to something highly significant. For the first time since the coup, Prayut was opening up public space for the two former premiers. "I don't know whether they (Yingluck and Abhisit) will come or not. Do they have the courage to come? Please, go and ask them. You can write stories asking them that question. You guys are ready to write critical things about me, but you don't have the guts to touch the others," Prayut said. Clearly, he was challenging both the press and the key political figures on both sides of the fence to come forward and make their views known. After this new and interesting twist, no one should be shocked if the political arena is awash again with rumours that the premier might be moving towards promoting a "national reconciliation government" that will comprise politicians of all shades and colours. In fact, there have been suggestions from certain quarters that the concept of a national unity government might be incorporated in a comprehensive package that forms the backbone of a revised road map. What if the new constitution contains a "provisional clause" spelling out the formation of a national reconciliation government to take over from the current interim administration under the National Council for Peace and Order (NCPO) before the next general election is held? What if a compromise can be struck among all the political groups and civil society for a to return to parliamentary democracy with an agenda and timetable that is acceptable to most of the parties concerned? There is nothing concrete about this proposition so far. But there is also a general belief that if no "common understanding" is reached among all the political groups in advance, the post-election scenario will be just a return to more chaos. As things stand today, there seems to be sufficient evidence to compel all sides to consider a solution that is based on reconciliation rather than the resumption of an all-out political free-for-all. In the unlikely event that Prayut, Yingluck and Abhisit do agree to go on TV together, that should be one of the main questions raised. 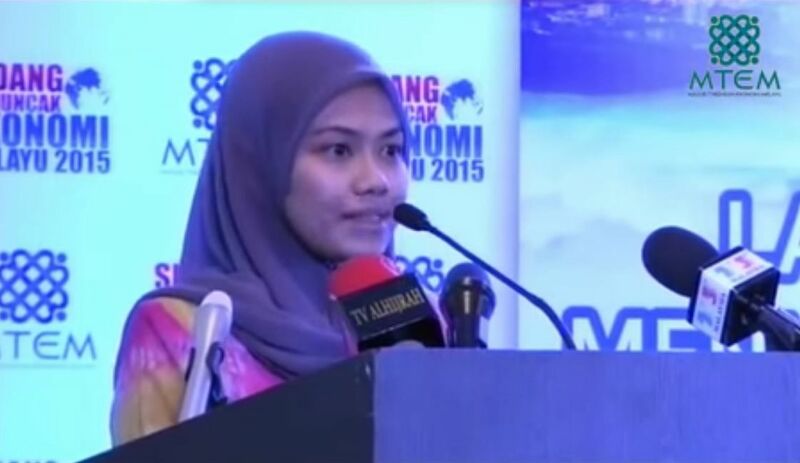 Last week, the lament of a 23-year old young graduate named Zahra went viral on social media after a video of her speech was posted by Majlis Tindakan Ekonomi Melayu Bersatu (MTEM) on its Facebook page. Zahra, a law graduate, took the podium at a MTEM address and spoke of the financial challenges my generation faces. She poured her heart out about how financial independence seemed impossible for Malaysians coming into the workforce today. "When I was a student, I always dreamt about my life after graduating. Because of the big salary that I thought I would receive, I could plan my life accordingly," she said to an audience that included Deputy Prime Minister Tan Sri Muhyiddin Yassin. Zahra added: "But almost two years after graduating, I am disappointed and angry with my fate. The reality of working life is torturous. Yes, I drive to the office, but the car is not mine. I borrowed it from my father and pay him RM500 each month for it." In the video, which had 38,500 views, 5,000 likes, and more than 7,000 shares as of last Friday, Zahra raised among other points that she has to pay RM500 a month to live in a rented place with seven others, and could not afford to buy a home in Melawati or Ampang until she takes home at least RM 9,000 a month. Her statements got me thinking, and believe me when I say I spent the weekend chewing over what she said. Because she's not exactly wrong. I'm in my early 30s, and I can feel how the odds are stacked against my generation when it comes to financial independence. I might not feel it as acutely. I do admit I am blessed with a family which is willing to continue helping to support me and my causes. However, I do recognise that there are many like Zahra who face harder challenges than I ever will. And here's when the light bulb went on in my head. Much as my family helps me, maybe, just maybe, we have to come together as a generation to help each other. Maybe we need to try a new common goal, one of inter-dependence opposed to total complete independence. I do believe we're put on this Earth with a unique set of privileges and challenges as well as strengths and weaknesses so we learn to come together in a mutual web of cooperation and support. Where we are strong and privileged, we can reach out to help those who were not blessed with our strengths and privileges. I call it the Great Web. It binds and links us all, if only we can open ourselves to it. And perhaps it's my generation's biggest test, to begin to shed the ego-driven, me-first mentality and come together as an interdependent family, celebrating the good times and helping each other through the challenges regardless of race, religion, social status, gender or sexual orientation. We just need the humility to open ourselves up to share where we need help and reach out as much as we offer our strengths and blessings to help others, much like in the old Chinese parable of the soul that saw Heaven and Hell. In the parable, a dying man wanted to get a sneak peek of Heaven and Hell before he crossed to the other side - and his wish was granted. He was first shown Hell, where he saw people weeping despite having tables laden with food before them. They tried to feed themselves, but the only chopsticks provided to them were three metres long. He was then shown Heaven, where to his surprise he saw the same tables and the same extra-long chopsticks. But instead of seeing angry and weeping souls, he saw people full of laughter and joy. He wondered what was so different and then he saw it. The people in Heaven fed each other. They had passed the test behind the chopsticks. I really do think we need more of that positivism if we are to survive the challenges Zahra raised. Are we going to pass this test, or are we going to fail gloriously?